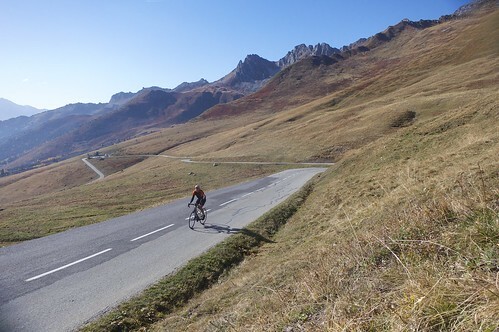 Col de la Madeleine is one of the very toughest climbs in France or so I was told by the charming old col-hunter at the otherwise deserted summit (he’s correct). There are two “famous” ways up, one each side via the D213. But there is a third possibility by road bike. The south side via Montgellafrey. North side via D213: 26.5 kms, 1610m ascent, details here. South “classic” side via D213: 19.5 kms, 1550m ascent, details here. South via Montgellafrey: 19.3 kms, 1550m ascent, details below. There is an even better “4th” way, but it requires a mountain bike or hybrid. 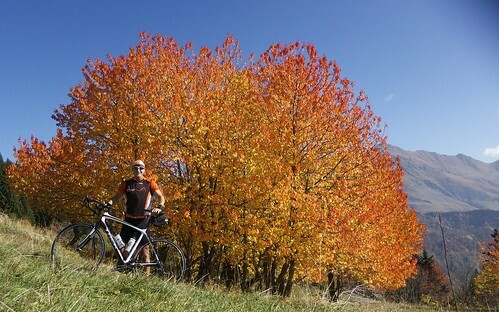 Still, the route via the amazing Lacets de Montvernier, Col du Chaussy, and Lac du Loup is beyond memorable. See here. 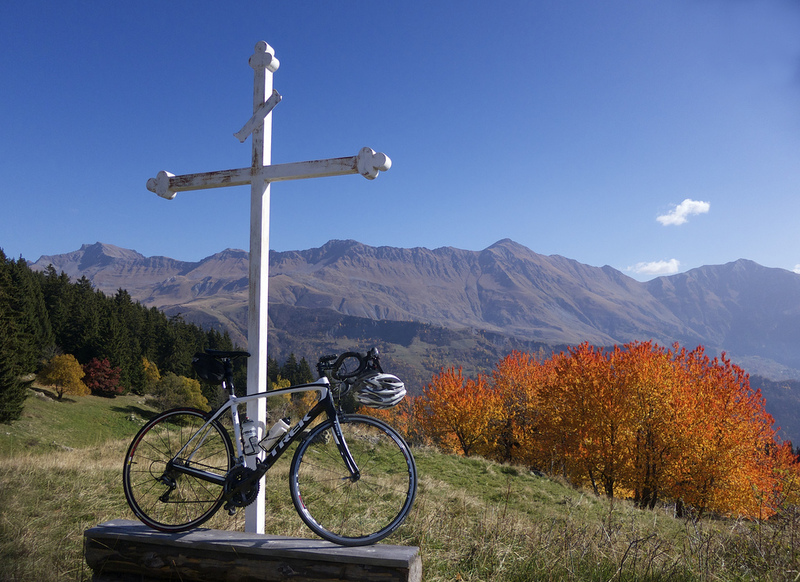 Late October has been warm, and I decided to take full advantage of perhaps the final chance for a big Alp climb in 2012 to visit this third way. I’d never climbed this alternate south side, although I have descended it several times. It is far quieter than the already fairly quiet main road. It’s a great choice during the busier summer period. Frankly, apart from the Tour history (understandably important to first time visitors), it’s a superior route. As shown above, the 2 southern options are equally difficult. Basically, each route climbs on either side of a deep, forested gorge. Plenty of views and hairpins. 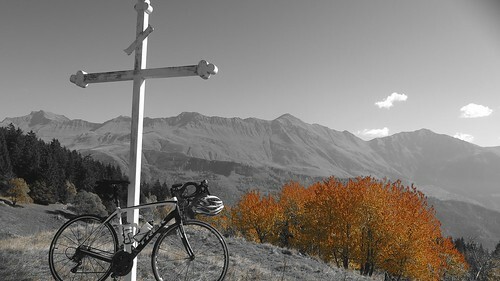 Note, the profile above is just for Col de la Madeleine. 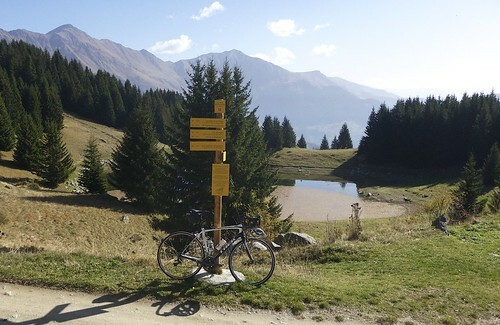 It excludes my midway detour to the Lac – perhaps 7kms and 450 metres of climb. Next, I descended back and rejoined the route to Madeleine. It merges with the principle road at the purpose-built ski station of St-Francois-Longchamp. Just three more kilometres above the tree-line, through the ski slopes. 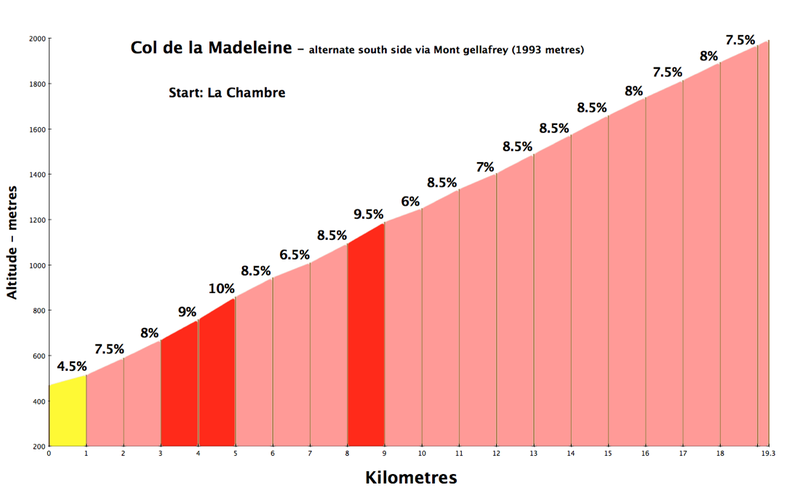 Today it was announced that the 2013 Tour will climb Madeleine via the standard south side — so cyclotourists will flock to it. But if you have the time, or prefer more solitude, I highly recommend this alternate less famous southern option. On the map above, I descended via the “classic” south side.